Tradition plays such an important role in our holiday celebrations. Traveling home and visiting family and friends for Christmas has long been a romanticized image of the holiday season. Now let the beloved traditions of the season inspire you with the Thomas Kinkade The Heart of Christmas Tree, a first-ever Thomas Kinkade candlelight tree with lights, music and motion, exclusively from The Bradford Exchange. 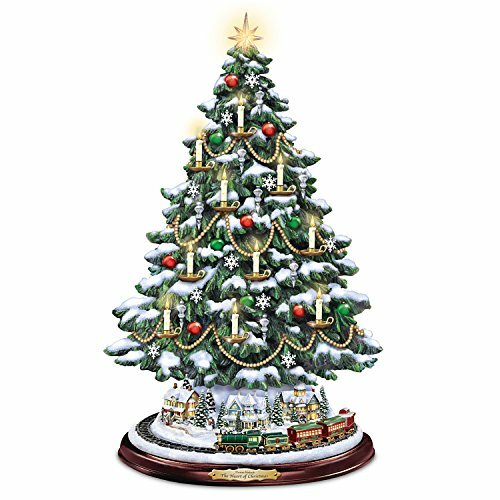 Handcrafted of artist's resin and hand-painted in rich detail, this tabletop Christmas tree is the perfect way to brighten your holiday season, year after year!Standing over a foot tall, this fully sculpted, handcrafted Thomas Kinkade tabletop Christmas tree gleams from the holiday village at the base to the golden star on top. In between are an abundance of classic holiday tree trimming favorites, highlighted by sculpted candles with "flames" that flicker like the real thing at the touch of a button, thanks to built-in LED lights. Hand-painted red and green ornaments peek from the snow-dusted branches along with silvery snowflakes and teardrop-shaped silver ornaments. Real beaded garland in bright golden tones drapes all around the tree.